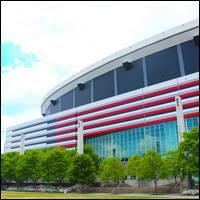 The Georgia Dome is home to the Atlanta Falcons but occasionally hosts large events and concerts. Parking: Parking is available in nearby lots for a fee. MARTA: Take any line to the Dome/GWCC/Philips Arena/CNN Center Station and follow the crowd from the platform up the walkway to the Dome.